I haven't had a lot of really good kayaking this summer and then this week I managed two nearly perfect days! Both days were different - here's the first day. The next day can come next week! I had offered to take a friend with me who wasn't used to kayaking but thought this area sounded beautiful. We used my kayaks but I can't get both on the roof racks at once. It's bad enough getting one up and tied down - let alone getting the second one on top of that! I just can't manage it! Fortunately Mullens Creek where we were going is only 5 minutes or so away. I took the first kayak down there and left my friend with it until I could get back with the second one. I suggested she might like to go out by herself until I got back but she looked a bit daunted at the prospect. When I got back she was talking to one of the local fellows who is a very interesting person. He is not a "birder" but still manages to see more birds than I do - plus a lot of other interesting things that I tend not to notice. He catches fish and crabs where others catch little or nothing! This morning he had a crab in his bucket and of course I asked for photos. These crabs are counted as a local delicacy! 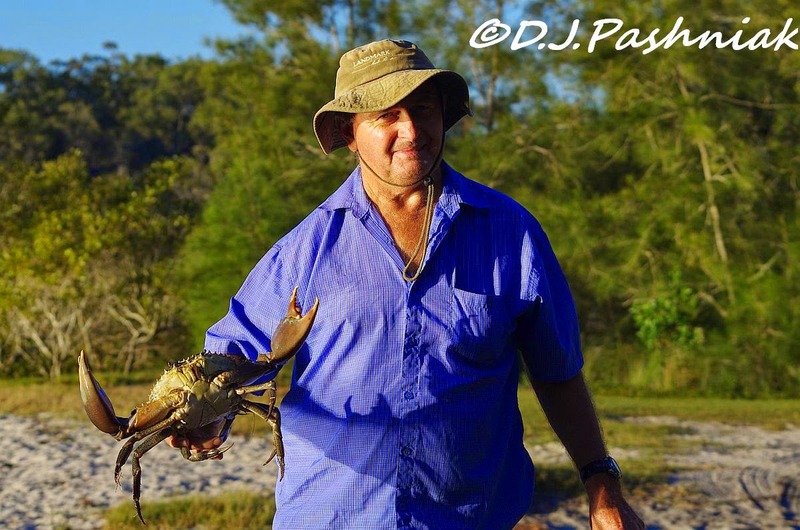 Here is Peter and the crab he had just caught that morning! He assures me that you just have to know how to handle them - I would rather stay well out of reach of those nippers! We then kayaked out to the airport roost. Unfortunately the Grey-tailed Tattlers and the Terek Sandpipers saw us before we saw them and flew off before I could get photos. There were at least 60 of them but I still have not managed to do a separate count of them as they stream off across the bay in front of me. 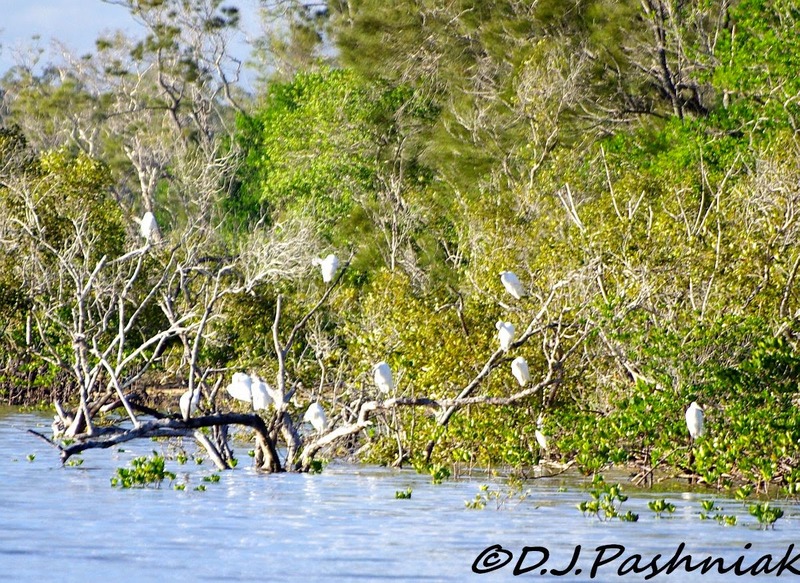 There were 13 Little Egrets all perched up in a taller tree - but they took off when the other birds did and came to rest again well up around the bay. 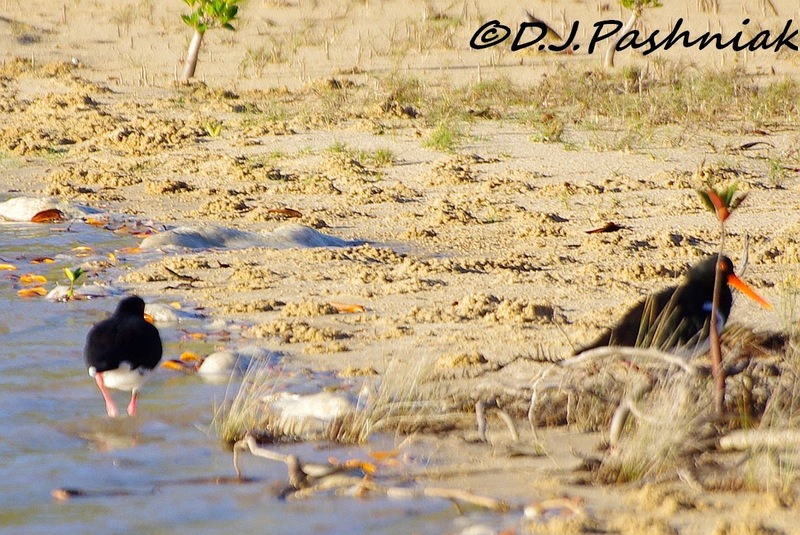 The pair of Pied Oystercatchers were not in the mood to wait around either so a quick photo as they moved off was the best I could manage. It was very beautiful out there with not more than a gentle ripple on the water. If you enlarge the first photo you can see the Little Egrets part way around the bay on the right of the photo. 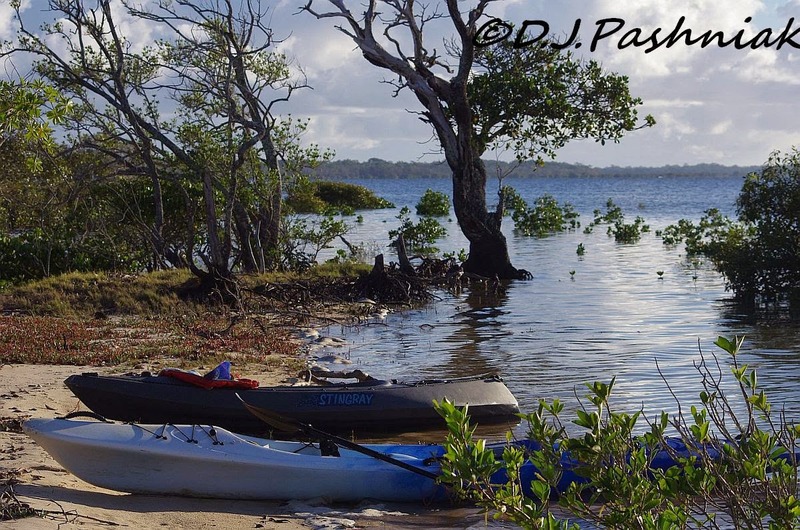 The second photo is the kayaks pulled up on the sand after we had gone to check for birds in the lagoon behind the sand spit. To finish off we paddled up the creek. 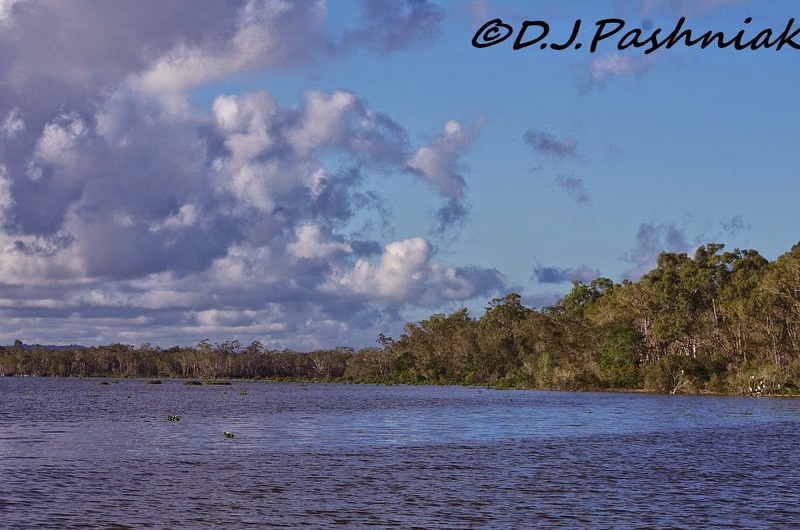 There was no wind at all up there with perfect reflections in the water and only the sound of bush birds calling from the trees and bushes beside us. 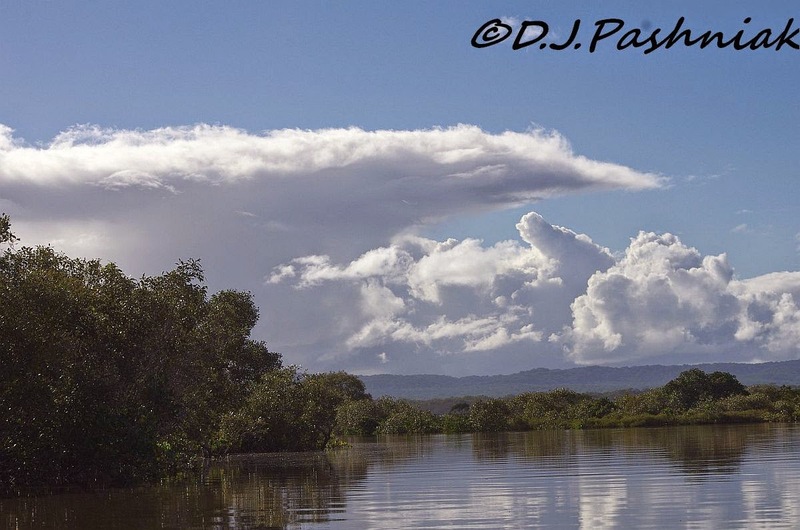 We could see rain falling from some of the clouds across the bay but it did not come near us. My next day kayaking I went out simply to photograph the birds I had missed. That's for next week's post! i bet your friend loved her first kayak experience! and i am amazed at that huge crab he's got in his one hand! go peter! Love the crab! Is that the Mud Crab, Scylla serrata? Yes, commonly called a "Muddy"! Great couple of days on the water wish we took our kayak on Sunday as it was so calm. Great shots of the place. That is gigantic crab. Wow, that is a huge crab! Pretty scenic photos and I love the birds. Especially the Oystercatcher! Great post, enjoy your new week! I'm picturing you trying to pile two kayaks on the roof of a car! Peter obviously knows where to catch the best crabs and I think I'd be tapping him up for a taster. Bad luck with the birds this week - something to look forward to. Oh, I do love crab, but to eat -- not to hold like Peter is!!! Such wonderful captures for the day, Mick, and what a fun day it looks to have been!! Thanks so much for sharing!! Hope you have a great new week!! Enjoy!! Nice size crab! Looks like a beautiful day to paddle! Glad you got to go! paddling on calm water sounds so wonderful. And great waterscape does it even better. A perfect day! Lovely shots. Such a huge crab! I would have been dead scared to pick up something like that. Oh my goodness...but, I bet that was so much fun!!! Looks like a great time all the way around. What a beautiful day for birding on the water. Great shots. Bonito día para ir en kayak, me encantó conocer el lugar. Now that's a crab to be proud of! Lovely scenery Mick. I bet your friend had a great time! My GOD man! That crab is FRIGHTENING! Peter appears to be a "wildlife whisperer"! :-) Awesome crab! 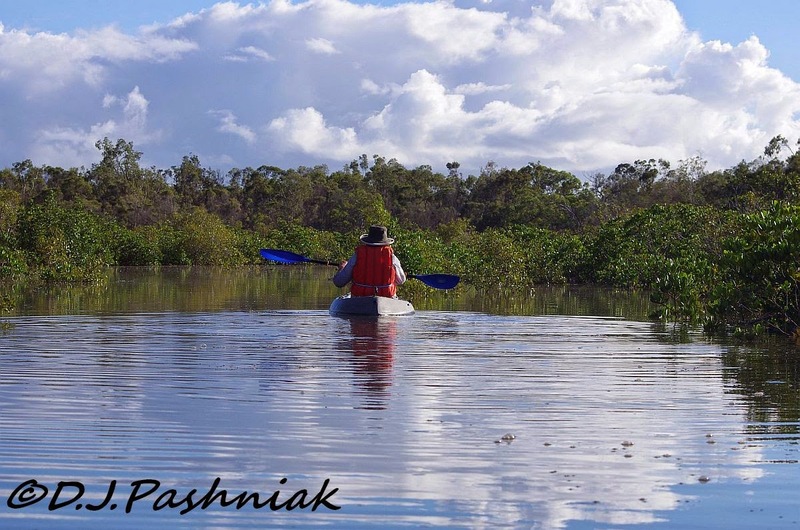 Beautiful photos...looks like you and your friend had a wonderful day kayaking! what a lovely and peaceful wayto see the birds adn their surroundings. So beautiful. Thanks for linking up with Wild Bird Wednesday. I'll never see these birds in person but it's nice to know they exist. 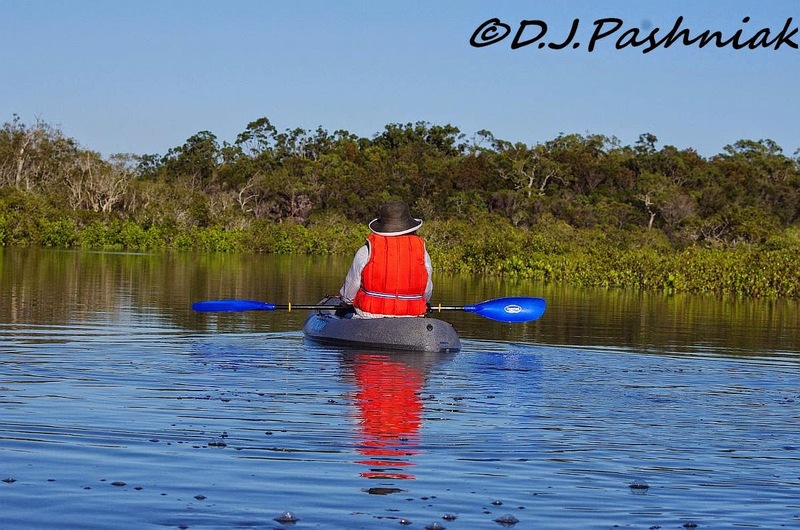 I, too, am a kayaker, canoer, birder and photographer. I'm about to leave for a kayaking, birdwatching trip with several friends, that will last through this Sunday. We will camp, watch birds at blinds, while hiking and kayaking, doing day trips. Thanks for your comment. I went over to your blog and read it and was very interested - but to comment it required a google+ account and I don't have one - nor do I want another account! Glad you got some kayaking time in! The crab looks a bit scary to me! I am so envious .... Beautiful area. Your friend was so lucky to have such a great guide and mentor... Loved everything about the post . That looks like a Dungeness Crab ... We catch them on the Pacific Coast (not from a Kayak). And that's a nice plump female, and in ORegon we have to throw them back. So sad when you pull up a nice heavy pot and it is all females or too small. Beautiful photos,lovely scenery. 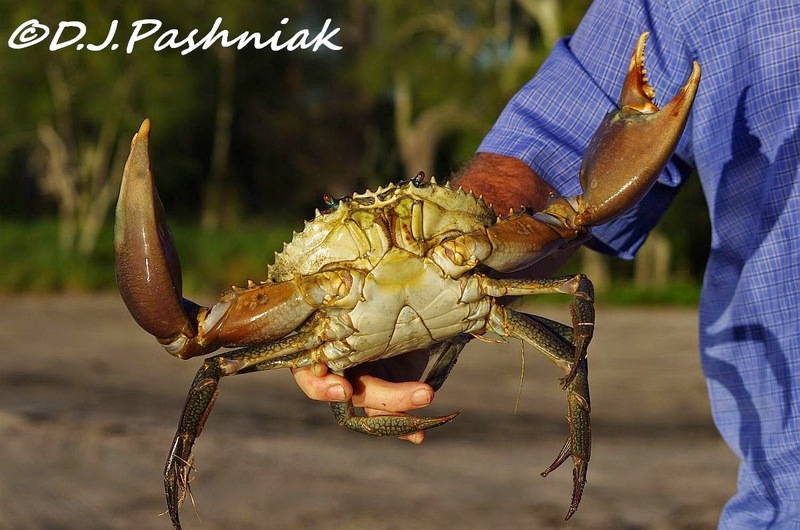 You are very brave to catch that large crab in your hand.